We too stayed home with the cats and they too were horrified with the firework ! Poor Arthur disappeared in my wardrobe and the others under the beds ! If you want to read how we spend New Year it is on my Writer Cramps blog. Happy New Year to the whole family and a kiss for the cats ! I played thundering herd of elephants all night. It was great. Yes, they look comfy there! I am sure we wouldn't like fireworks either but out here in the desert we don't have any! Thank you for stopping by! Anyway, Happy New Year 2008 to all! Happy Happy New Year to you~!! Yes , they really look comfy! We had a quiet New Year Fest too here! Happy New Year! You cant really hear the fireworks at the Spice Cats house, so they don't know what fireworks are. Au and Target sure look very comfy on the sofa. Cute! They are so cute snoozing on the couch! Kiss kiss to the kitties! 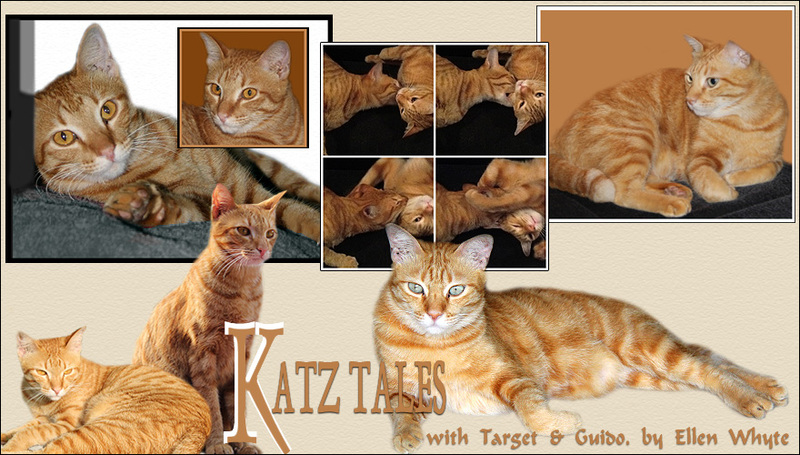 Hope it is not too late to wish everyone in this Katztales Happy New Year,though Feb is round the corner.Yes talk about those fireworks,well my neighbour has been doing renovation about 5 months time n they are far from done..so every time the machines going.Tratt Tratt!! n the lorry loads down them bricks n sand,Whoosh goes Bubble,sometimes u could hardly see her races up the stairs or better still she will literally crawl on her stomach to go under the sofa..n giving out that low throathy growl..poor dear,the sound must be deafining to her.